Putting video on your website is the best way to get your message across. The act of putting a video on your website is called embedding, and in this guide we’ll show you how to get it done right. Once the media file is uploaded and the media gallery settings and customisation are done, the gallery is ready to embed on your web assets or share with friends. Once you’ve uploaded and customised your video, you’re ready to go ahead and embed. Note: you can make changes in gallery settings and it’s customise after the gallery is embedded. Those changes will automatically apply anywhere the video is embedded. An embed code is a snippet of code that you can use to add content (like a video!) to a web page. In the last step (last screen) of Cincopa wizard, after uploading media files. 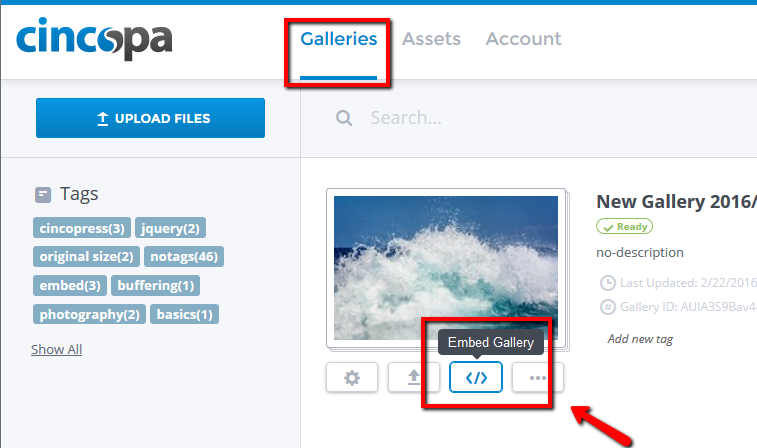 Go to “Galleries” page, choose from the list of galleries the one you want to embed and click on the “embed gallery” icon. Choose the method you want for embed. Cincopa offer many ways to embed media galleries based on destination and needs. This method is compatible with any website. The embed code will place the video directly on the page, inline with the rest of your content. Grab the embed code and place it in to your website. Cope the code and place it in your website. While the Standard embed HTML code will work great in most cases, some websites can give it a little trouble. 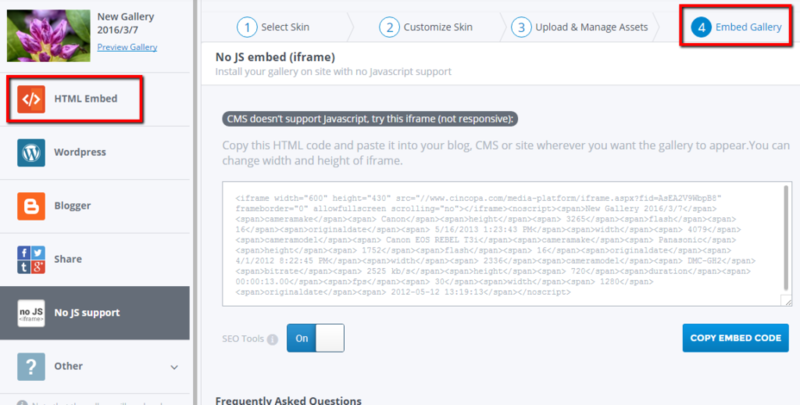 Use iFrame Embed code when your CMS does not support JScript. 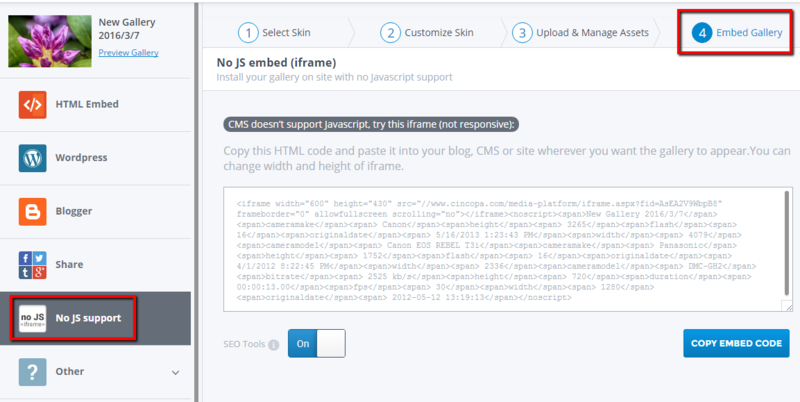 Use iFrame Embed code when your CMS does not support JScript. Cincopa allows you to embed any media gallery into an email marketing campaign or email newsletter. Embedded media will show up in a form of a custom sized thumbnail opening the gallery in a new browser tab on click. 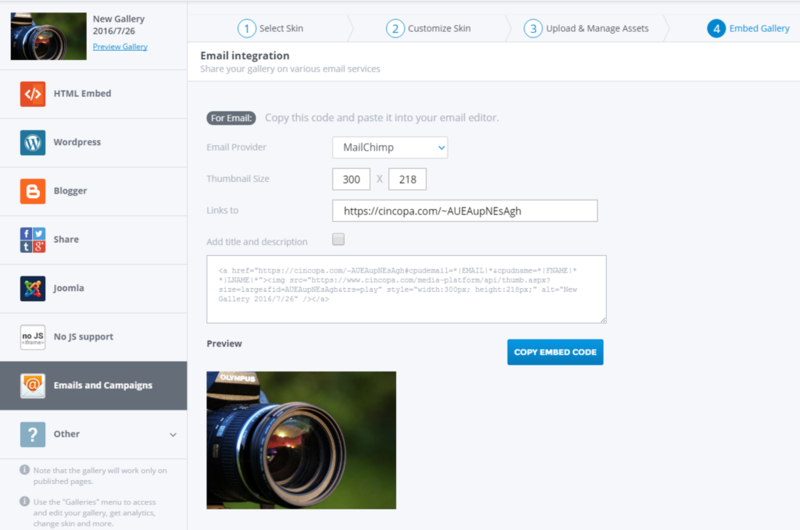 Cincopa supports integration with basically all top email marketing providers, including MailChimp, Constant Contact, GetResponse, Vertical Response, and others. Besides, you can embed a gallery into a single email message that using a web-based email client like Gmail. Cincopa allows you to embed any media gallery into an email marketing campaign or email newsletter. More information on embedding media galleries in email Campaign. Copy the wordpress tag and paste it in your blog. Get WordPress plugin directly from WordPress.org site, install it and follow the instructions. 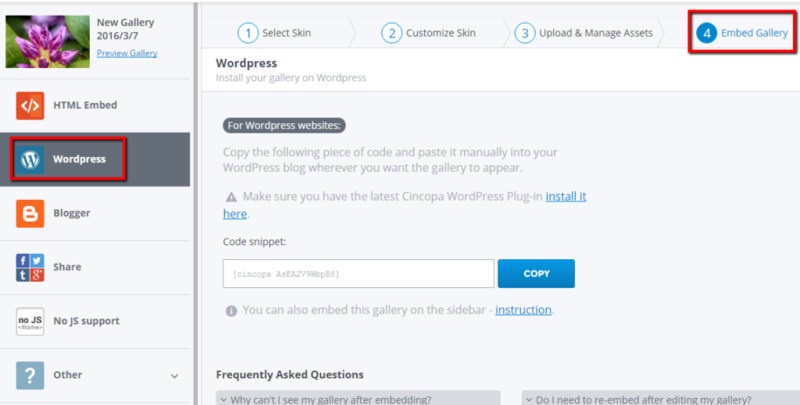 Copy the wordpress tag and paste it in your blog. In cincopa embed page you can find specific support to various CMS systems such as: Drupal, Blogger, Joomla, Drupal, office 365, Ebay, iTune, Tumblr and more. Click on “Other” in the Embed page side menu to view all options. SEO is a set of tools and processes to help search engines identify and index your videos. Cincopa Standard embed codes are automatically SEO-friendly, and they’ll help people find your videos on your website – not someone else’s. You can disable SEO before generating the embed code by switching “SEO Tools” toggle to OFF.